Prof. Dr. rer. nat Jan-Peter Mund was appointed as a Research Professor at HNEE in September 2018 and holds a Federal Research Professorship for 4 years from 2018 to 2022. On September 2018, Prof. Mund, Prof. Cremer and BioEcoN Coordinator Kevin Beiler attended the opening of a project meeting at the Vietnam national University of Science in Hanoi. The BioEcon project team signed a number of Memorandums of Understanding (MoUs) regarding the implementation of the project. The BioEcoN Project aims to developing teaching materials ont he topic of bio-economy. It addresses the level of academic, methodology and institutional skills among all universities through the design and development of a new graduate blended or e-learning programm. In times of resource scarcity, a bio-economy based on renewable resources like forest products is one to increasing consumption of materials and energy. Bio-Economy in itself cannot be considered as self-evidently sustainable. The BioEcoN project has been funded under the Erasmus+ Programme of the European Union for three years from the end of 2017. It is co-hosted by HNEE, VNU University of Science, University of Valladolid from Spain, South-Eastern Finland University of Applied Sciences from Finland, Vietnam National University of Forestry and Thai Nguyen University of Agriculture and Forestry. An IFEM Student has started his research internship in Cambodia at the Wildlife Conservation Society, (WCS - Cambodia). He will collaborate with Mr. Phien Sayon and participate in several forest and ecosystem protection acitivies in Cambodia applying his UAV aerial image collection capacity and exchange knowledge about using UAS for nature protection and conservation topics in South-East Asia. HNEE-Professor und Försterin vom Forstgut Sauen / August Bier Stiftung tauschen für einen Tag die Arbeitsplätze im Rahmen des Projekts „PerspektivWechsel“ des MWFK. 70 participants from 20 countries participated in the two-week long GeoServices-4-Sustainability (GeoS4S) international summer school which concluded in Eberswalde on 21 Julye 2018. Organized at HNEE together with a consortium of 10 universities from Europe, China and Thailand, the project is co-funded by EU Commission under the Erasmus Plus programme. Participants were taught 10 modules on geo-informatics by lectures from different partner universities that took the lead in delivering the specific courses. Prof. Jan-Peter Mund, Frank Torkler and Stuart Krause represented the teaching capacity from HNEE. Digital records - like paying by credit card or recording sports activities with the help of a fitness tracker - help to paint a detailed picture of our movement patterns and the associated activities. Most mobile phones deliver data that determines our location even more precisely and, above all, uninterruptedly. The AGIT Symposium & EXPO 2018, chose the focus “me | places | spaces”. For the first time a group of HNEE students on the initiative of Prof. Mund took part in the event from 4 to 6 July. Representatives from research and industry discussed the role of the geo-information industry in an urban world in the context of smart city initiatives, their challenges on issues such as energy, infrastructure and mobility. 50 students from more than 20 faculties coming from 10 universities and institutions in Germany, Austria, Netherlands, Czech Republic, Thailand and China attend the GeoS4S Summer School in Nanjing, China. For two weeks, expert practitioners specialized in the field set up ten professional courses, and intend to develop and enhance students' spatial thinking and practical skills in those area related toGIS. They will explore topics such as ‘Incident and Crisis Management for Sustainability’, ‘Geo-Visualization’ ‘Smart City’ and more. Prof. Jan-Peter Mund together with Stuart Krause (Msc FIT) delivers modules on Forest Biomass and Carbon Stock Quantification. In the sessions students will learn methods and tools for estimating, quantifying, calculating and monitoring the baseline of different carbon pools and carbon stocks chances related land management measures. With the Summer School from 9.-16. March, the GeoS4S provides opportunities to the current learner/students to acquire knowledge and skills in addition to their regular curricula, in an international learning environment. The Geo-Services 4 Sustainability (GeoS4S) project is funded by the European Union and aims to develop a master course curriculum around geo-informatics and sustainability. In the second wekk of June the second BioEcoN Technical and Curriculum Development meeting was successfully conducted at the Mikkeli technical University in South-Eastern Finland. During the first week of March 2018, the BioEcoN consortium met for the first technical meeting at the Vietnam National University of Forestry in Hanoi. The BioEcon-Project aims to develop a Msc. Curriculum on sustainable bio-economy by 2020. Researchers and lectures from HNEE but also Spain, Finland and Vietnam used the meeting in Hanoi to discuss the topic of bio-economy. Sharing these approaches indicated different traditions and multi-actors perspectives in the four countries. These perspectives will flow into the learning and teaching materials to be developed. At the end of the meeting the team agreed on work packages to be implement until the next technical meeting in June 2018 in Finland. Today mapping and navigation are amongst the most popular everyday usages of mobile devices. Finding your location on a phone is no longer a novelty, it has become a standard consumer expectation. HNEE FIT students attended the WhereCamp2017, while Prof. Mund chaired the session No 3 in the University track at WhereCamp 2017. The KWF Focus Days in Paaren/Glien take place on 27th and 28th September. The conference focuses on IT solutions in forestry. Prof. Jan-Peter Mund will speak on data standardisation in a forum on data management in forest monitoring and joins a discussion on opportunities and risks of big data in forestry. The UAV Research Group will the use of drones for forest applications. HNEE will also present efforts on logistics and forest growth and yield. At a press conference ahead of the upcoming KWF Focus Days 2017 , Brandenburg’s Environmental Minister Jörg Vogelsänger witnessed drone demonstration flights performed by HNEE. Stuart Krause from HNEE’s UAV Research Group showed how drone imagery can support forest survey or monitoring for forest pests. With the idea of a European-Vietnamese Higher Education Network for Sustainable Forest- and Bio-Economy, HNEE was successful in the latest Erasmus Plus Call on Capacity Building in Higher Education. The proposal was selected amongst 756 eligible applications for the call. Together with three Vietnamese Universities, the South-Eastern Finland University of Applied Sciences and the University of Valladolid HNEE aims elaborate high quality teaching materials and curricula on bio-economy. Prof. Mund who took the lead on developing the proposal explains the idea. “The participating universities have the opportunity to renew and align their curricula towards multidisciplinary skills and competencies. This will better support innovative activities allowing students and future professionals to interface different topics and to foster collaboration between the diverse disciplines of bio-economy”. Currently, administrative and project management procedures are elaborated to enable the project to kick off. 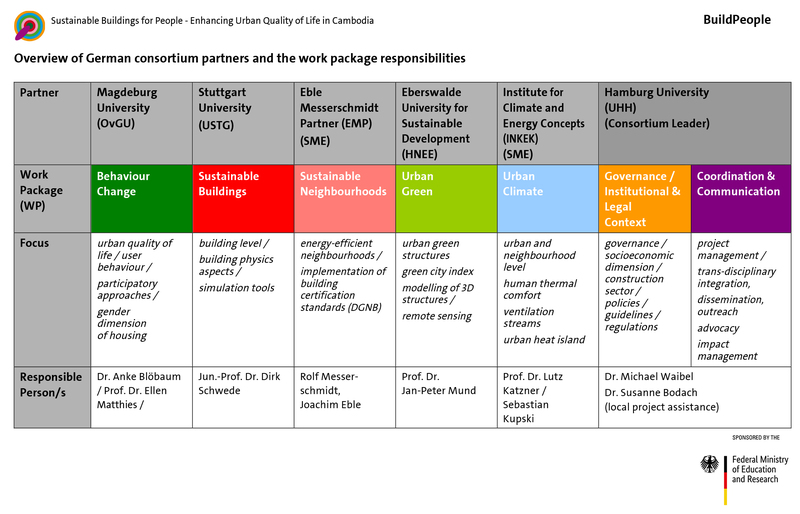 Five German universities (including HNEE) and an architect partnership received funding from the Federal Ministry of Education and Research to develop a research project on sustainable buildings to enhance urban quality of life in Cambodia. A stakeholder workshop in Phnom Pen will gather counterparts’ contributions and feedback to the project. As contribution of HNEE, Prof. Mund envisions to develop an urban green index based on remote sensing products. Methodologically, this research aims at linking human viewpoints directly with ecological aspects of urban green. The gathered climatic information can be used in the future to prepare recommendations at the neighbourhood level in a 3D simulation. For more information, follow the project on Facebook. In November 2016, two FIT students and one IFEM student have won the first prize at the ESA GSA Gallileo Hackahthon on location-based service at the Beuth Hochschule in Berlin. The GIS learners from HNEE showed that they acquired excellent coding skills. Well down! The Hackathon was part of the WhereCamp 2016 at Beuth Hochschule in Berlin.